By Maria Ribot (Managing Layout Editor) The Vertical and WIRED are collaborating to make the switch of the century. Both crews will swap to see what it’s like to fulfill each other’s roles and responsibilities. In these next couple of weeks, the WIRED crew will be in the journalism room, learning how to pitch, plan, write, layout, and publish news stories. Currently, the WIRED crew is beginning to write their pitched and approved stories, which will appear on the March 2019 issue of The Vertical, which came out in March. The Nease Wired news broadcast show and The Vertical, the school newspaper, collaborated to switch places and experience what it’s like to be in each other’s place and appreciate the contributions that video and print journalism have in communications. Much of February for WIRED member consisted of producing stories, editing, and laying out in the computers while The Vertical staff members worked with WIRED to produce their very own package. Both WIRED and The Vertical were eager to make this switch for the purpose of experiencing a type of journalism that they are not used to. As the thought process and conceptualization of both stories and packages progressed, both teams realized how rigorous is the work to produce and publish either forms of journalism. This switch helped bring awareness to mainly print journalism, as it is becoming less popular among high school students. Stay tuned for the epic and iconic WIRED and Vertical switch! Follow us on Instagram at @nhsvertical and WIRED on @neasewirednews Update 1/29/19 The WIRED teams have started typing their stories into an official, shared document to start the editing and revision process. As the WIRED team drafts their stories, they progress through the interview and transcription process at the same time. After their first draft is done, they will endure the editing process, which will last until our Co-Publishers send off the newspaper files to go to print. Stay tuned for the epic and iconic WIRED and Vertical switch! Follow us on Instagram at @nhsvertical and WIRED on @neasewirednews Update 2/8/19 The WIRED teams have finished their second draft of their stories and have started receiving edits from The Vertical staff members and revising grammar and spelling throughout their stories. Once the editing process concludes, the WIRED team will face the computers and interact with our dear friend, InDesign to layout their story on an actual newspaper page. Stay tuned for the epic and iconic WIRED and Vertical switch! Follow us on Instagram at @nhsvertical and WIRED on @neasewirednews Update 2/15/19 The Nease Wired news broadcast show and The Vertical, the school newspaper, collaborated to switch places and experience what it’s like to be in each other’s place and appreciate the contributions that video and print journalism have in communications. Much of February for WIRED member consisted of producing stories, editing, and laying out in the computers while The Vertical staff members worked with WIRED to produce their very own package. Stay tuned for the epic and iconic WIRED and Vertical switch! Follow us on Instagram at @nhsvertical and WIRED on @neasewirednews Update 3/1/19 Both WIRED and The Vertical were eager to make this switch for the purpose of experiencing a type of journalism that they are not used to. As the thought process and conceptualization of both stories and packages progressed, both teams realized how rigorous is the work to produce and publish either forms of journalism. This switch helped bring awareness to mainly print journalism, as it is becoming less popular among high school students. Stay tuned for the epic and iconic WIRED and Vertical switch! Follow us on Instagram at @nhsvertical and WIRED on @neasewirednews Update 3/8 Newspaper staff members’ packages aired today! We couldn’t be more proud of our accomplishment that we’ve achieved. Video journalism requires a completely different area of expertise and it was definitely hard to cope with everyday challenges. Stay tuned for the epic and iconic WIRED and Vertical switch! Follow us on Instagram at @nhsvertical and WIRED on @neasewirednews Thank you WIRED and Mr. Cooler for this amazing opportunity and we are looking forward to working with you in the future! When the time comes for a new issue of The Vertical to be distributed around school, the newspaper staff is always careful to make sure a copy is available for everyone to read. In the days after distribution, it’s always great to see people picking up the paper and reading. We also have noticed students using the paper to do other things, so to help those students who want to do more than just read it, we came up with…. 27 Things to do with The Vertical 1. Impress and horrify the people around you by eating an entire wad of the paper. 2. Create a paper mache significant other who will care about you. 3. Make an 18th century gown out of the pages for your little sister’s barbie doll. 4. Write an angsty note over the articles, tear the pages out, stuff them in a bottle, and send the letter across the world. 5. Sell it on ebay for a quick five bucks (If you advertise it right). 6. Make a paper mache effigy of King George III and then burn it to protest the unfair Stamp Act. 7. Create a code made entirely of headlines and then start drama using said code. 8. Wish Florida was cold enough for a snowball fight? If you wad up the pages of The Vertical, lower the temperature of your house and use your imagination, your wish can become a reality! 9. Save it until you become a rich adult, bury your life earnings in a box somewhere in Mexico, draw a map on the Vertical, give it to your children before you die and lead your spawn on a magical adventure. 10. Make a paper fan. 11. Roll up a copy and use it as a microphone. 12. Gently tap your former significant other over the head with it. 13. Act like you are reading it while secretly listening in on said former significant others’ conversations. 14. Cut it up and use it as confetti to celebrate your best friend’s birthday when you inevitably forget about it. 15. Rap the articles and participate in some good wholesome fun at school. 16. Use The Vertical as an umbrella during the inevitable Florida showers. 17. Make a collage from the words and pictures of all issues put together or a nearly untraceable letter. 18. Use it as a dustpan to scoop up the dead roach that has been decomposing in the back of your closet for weeks. 19. Roll up individual pages into a ball and challenge your classmates to trash basketball. 20. Forget about it in your backpack for years but then discover it later in life and relive your high school years. 21. Use it to make the ultimate paper airplane. 22. Experiment to see how many times you can fold the paper. 23. Use it as firewood for your textbook bonfires. 24. Attempt to make an origami crane with it and fail miserably, leaving you with wad a of paper. 25. Use it to save the planet by just recycling it. 26. The weather in Florida can be pretty ugly at any given time. And with the lack of grass at Nease, the rain can make the ground muddy and gross. Instead of getting that all in car, you can avoid the mess by lining floors of you car with copies of The Vertical. 27. Just like with your car lining, The Vertical works great with your cat’s litter box, too! With the school year coming to an end, the class of 2017 is starting to say their goodbyes to teachers, students, friends, and even the walls of Nease High School. Senior year consists of many memorable activities, one being the classic senior pranks. Since the opening year of Nease in 1981 pranks have always been a tradition. So since the beginning years of Nease, what have been some of the pranks at our very own school? The seniors will go to multiple extremes and there is no telling what they will do each year to prank the school. After asking multiple teachers that have been to Nease or have been working here awhile, some of Nease’s old senior pranks were discovered. One year the seniors posted the dean’s car, a Corvette, onto Craigslist for only 3,000 dollars with her work number as the contact number to purchase the car. She was appalled and had to announce over the intercom to the school that she was not trying to sell her car and that the students who posted it needed to remove it immediately. Additionally, what would be better than pulling pranks on the junior class? That’s why some other jokes that the seniors pulled on juniors was unscrewing their license plates and laying them all across the parking lot or taking air out of their car tires. Ms. Gruhn says, “My junior year, there was a huge rivalry between the senior and junior girls so all the senior girls posted the junior girl’s names all over the school the day before the powder-puff game. It was random but it did scare us for some reason.” Even more recently, the class of 2016 had an interesting prank that consisted of rollerblading, skateboarding, and biking around the school forming a little stampede of people racing around as fast as they could. Many people were laughing and trying to get out of the way before they got run over. However, the real question is what is in store for the all the underclassmen and administration this year? Will the class of 2017 fulfill their duties and make the senior prank one to remember? Watch your back, Nease, because the time is coming for the seniors to unleash their pranks! Nease’s musical theatre students performed the musical “Back to the Eighties” on April 18th and 19th in the PAC. Both Mrs. Poe and Mrs. Laird’s classes participated in the production. In addition, the drama department hosted an additional performance, with Mrs. Laird also directing Nease’s annual spring play; this year, the play was Blithe Spirit and was performed on April 6th, 7th, and 9th. Back to the Eighties is a musical in which every song is a famous hit from the 1980s, such as “Time of My Life”, “Wake Me Up Before You Go-Go”, “Girls Just Want to Have Fun”, and “Material Girl”. The story follows an awkward teenager named Corey (played by Parker Tenney) who is desperate to ask out Tiffany, the prettiest cheerleader in school, and become the class president. The only thing that stands in his way of those goals is Michael, the school jock. The cast underwent rigorous rehearsals from February until opening night. The costume, hair, and makeup crew strived for authenticity in their wardrobe and style choices for the actors, making sure that each article of clothing and makeup technique was true to the fashions that made the 1980s so unique. “Costuming isn’t just going with what fits the setting,” says Elizabeth Stitt, a member of the costume crew. “You have to take into account the character and the emotions and who they’re supposed to be. 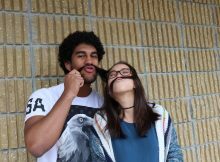 It’s more complex than people make it out to be.” Sophomore Bri Rankin, who was on the publicity and advertising committee, says, “We are all very proud to be a part of this production and this department. 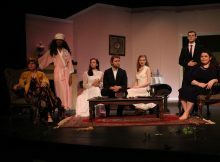 The show is sure to be a product of hard work and passion.” Blithe Spirit, Nease’s spring non-musical play, was a comedic straight play about a doctor whose wife had died. After getting remarried to another woman, his ex-wife’s ghost comes back to haunt him, which brings a lot of comedy into the show. There may have been only seven cast members, but that does not mean the production was any less entertaining or satisfying than the forty-five-member cast of the musical. Blithe Spirit’s actors and behind-the-scenes crew tried to create the perfect setting for the play, which takes place in England in the early 1940s. The play was co-directed by Mrs. Laird, the drama teacher, and Alexis Gilliard, a senior student. About directing the play, Alexis says, “I’ve totally enjoyed working with these actors and the tech crew. It’s definitely an experience that I’ll remember for the rest of my life. I hope the audience has as much fun watching it as we did producing it.” The play starred Alexandra Hudson as Ruth Condomine, the ghost. The year 2016 has come and gone – and it took many beloved celebrities with it. Many famous men and women passed away last year, and each one deserves to be remembered. The first notable death of the year was on January 10th, when famous musician David Bowie died at age 69 because of liver cancer. He was a singer known for hits such as; “Space Oddity”, “Ashes to Ashes”, and “Starman”. Bowie was soon followed by actor Alan Rickman. He was known for playing the character of Professor Snape in the Harry Potter movie series. He passed away on January 14th at the age of 69 as a result of pancreatic cancer. On March 6th, at age 94, former First Lady Nancy Reagan died due to of heart failure. She was the wife of President Ronald Reagan. She was known as a style icon during her years in the White House and was an advocate for drug prevention during the 1980s. The month of April took two important contributors to the music world. The first was Merle Haggard, a country superstar who died at age 79 on April 6th. His most famous songs included “Okie from Muskogee”, “Fightin’ Side of Me”, and “Branded Man”. He was honored in 2010 with a Kennedy Center Honor for his contributions to music. Second, Rock star Prince died of a fentanyl overdose, at age 57 on April 21st. The “Purple Rain” singer is now considered a legend; Rolling Stone called him “one of the most influential artists of the rock and roll era.” One of the most talked-about demises of 2016 was that of boxer Muhammad Ali on June 3rd. He was 74 years old and died of septic shock, a result of his long battle with Parkinson’s disease. He fought for civil rights in the 1960s and was widely known for his quote, “Float like a butterfly, sting like a bee.” On August 29th, Gene Wilder passed on at the age of 83. He was known for his role as Willy Wonka in the 1971 movie Willy Wonka & the Chocolate Factory. September 10th claimed the life of Arnold Palmer, who was a well-known professional golfer in the 1950s and 60s. He passed away at age 87. Even if you are not familiar with the man, you probably are familiar with the drink: the Arnold Palmer – a mix of lemonade and sweet tea. A week later, on September 17th, actress Charmian Carr died. She was most famous for her role as Liesl in the 1965 movie The Sound of Music. On Thanksgiving Day, 2016 actress Florence Henderson died. She garnered national fame in the 1970s for her celebrated role as Mrs. Brady on the classic TV show The Brady Bunch. The following day, Fidel Castro’s demise made worldwide headlines. The 90-year-old ex-president of Cuba died in his home. The communist leader was president of Cuba for 32 years before resigning in 2008. December took more celebrity lives than any month preceding it. The first death of December was on December 8th, when John Glenn died. He was the first American to be put into space and orbit the Earth. He passed away at age 95, and was nationally mourned and remembered for his trailblazing journey into space. On December 13th, actor Alan Thicke died. He was known for playing Mr. Seaver on the popular 80s and 90s sitcom Growing Pains. Early on Christmas morning, 80s pop icon George Michael died at age 53 of congestive heart failure. He sang some of the biggest hit songs of the 1980s, including “Wake Me Up Before You Go-Go”, “Last Christmas”, and “Careless Whisper”. Two days later, actress Carrie Fisher suffered from cardiac arrest and died at age 60. She gained international fame for her iconic role as Princess Leia in the Star Wars movies. The very next day, her mother, Debbie Reynolds, died from a stroke at age 84. Reynolds was most famous for her role as Kathy in the classic 1952 movie Singin’ in the Rain. Her last words reportedly were, “I want to be where Carrie is.” So many icons and historical figures were lost, and many deaths were heartbreaking to hear about when they happened. Keep these people in memory, but remember that 2017 is a brand-new year with a lot of hope and promise. 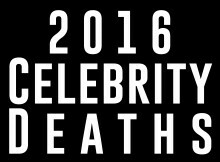 Contrary to what most people think, 2016 does not hold the record for the most deaths of famous people. According to TV Guide, 2016 has taken the least famous lives in the last six years. 2013 saw almost 140 famous deaths, and 2015 saw roughly 100. 2016 only lost about 60 noteworthy people’s lives.